Actually, the pies are from the oven -- the ingredients are from the garden. The rainbow chard is still plugging along and I cut a big batch and then didn't have a good idea of what to do. 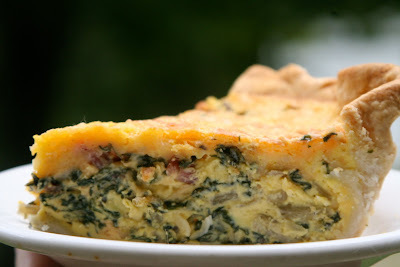 So I decide to make a pie or tart perhaps a quiche depending upon your particular choice of vernacular. I always keep some store-bought pastry in the fridge. While I am usually opposed to such things, even the most snooty chef's will buy their puff pasty and virtually all of them buy their filo and while I can throw together flour and lard with the best of them, after an afternoon in the garden if I had to make pastry, it would starve. As for a bought pie crust, in order to get it to unroll without breaking, you need to let it set at room temperature. However, it you let it get too warm, it won't bake properly -- so after you unroll it and place it in your pan, you need to return it to the refrigerator for a bit to firm it up. Both of these pies have an egg base, so I blind bake the crust. Take your chilled crust and carefully line it with parchment paper or foil. Fill the parchment with dried beans or pie weights (yes, I have pie weights and I also have an old jar filled with navy beans that I use) and bake in a 375 degree oven for about 10-12 minutes. Take the crust and carefully remove the parchment with the beans. 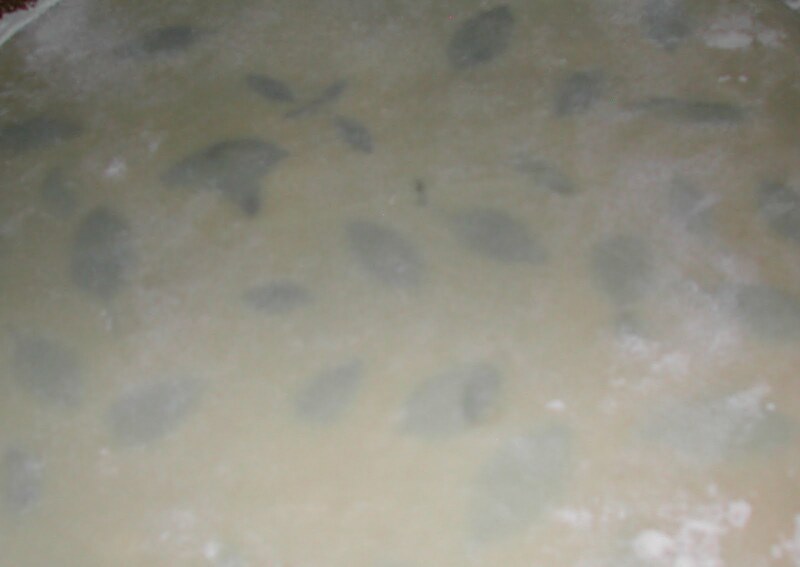 In a traditional blind-bake the crust is returned to the oven and baked again. 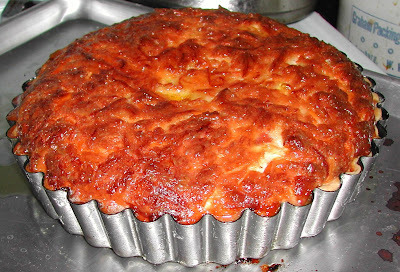 This is done when filling a crust with something like lemon or custard that is already prepared and won't be baked again. For these pies, I simple baked them to firm them up and not to be totally done. Some people don't bother with the blind baking. If you feel like skipping the step, try sprinkling a layer of cheese on the bottom of the crust and then pouring in the filling. While the crust is blind baking, add 1 tablespoon of olive oil to a skillet, add onions and garlic and sauté until translucent but not browned, about 2 minutes. 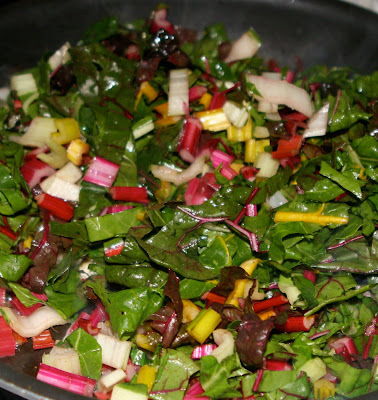 Add the chopped chard, salt and pepper and sauté another 5 minutes. Remove from heat. Mix the eggs, milk and cream and beat until smooth. Fold in the cheese. Add the sautéd vegetables to the pie crust. Pour the egg mixture over the vegetables. Resist the urge to overfill. Bake in a pre-heated oven for 45 minutes. When my friend Ann was here in July, she asked for a tomato pie. She thought it sounded good, but had no recipe or real concept, she just thought it sounded good. Most savory tomato pies in the South are made with tomatoes and a blend of cheese and mayonnaise. It is like a big pimento cheese sandwich with tomatoes. In fact, when I make pimento cheese, I always think about making extra for just such a dish. 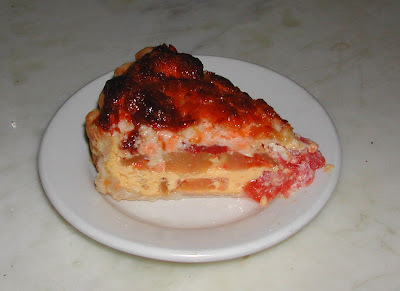 Anyway, I decide to make the filling a custard and top the pie with "pimento-cheese" crust to cut some of the richness. Once again, I used a store-bought crust. My advice is to look upon a store bought crust as a single ingredient in a pie crust that you make your own. 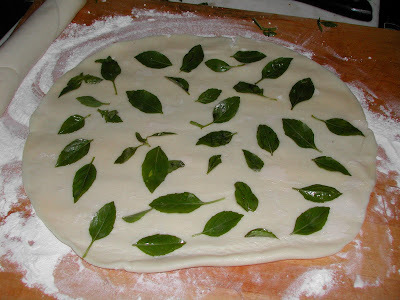 For the tomato pie, I made a basil crust by taking one of the crusts and layering it with fresh basil from the garden. I topped it with the other crust and rolled it out so the basil became visible. Then blind baked the crust. Mix the cheese and mayonnaise in a bowl. In another bowl, mix the eggs and half & half until smooth. 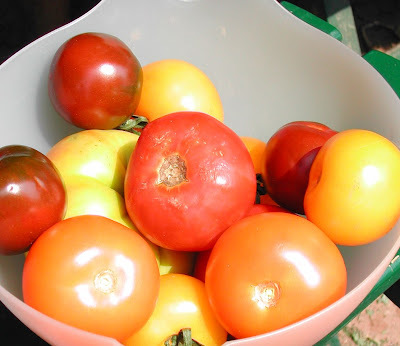 Layer the tomatoes into the pie shell. Pour the egg mixture over the eggs leaving about 1/2 inch of space. Spoon the cheese mixture over the top. Bake in a 350 preheated oven for 45 minutes. Remove and let sit for another 15 minutes before cutting. There is no salt in this recipe, because I find the cheese mixture to be a bit salty. Even with the custard filling, I must say this recipe was almost too rich. When Ann was here, she left me her really nice camera. 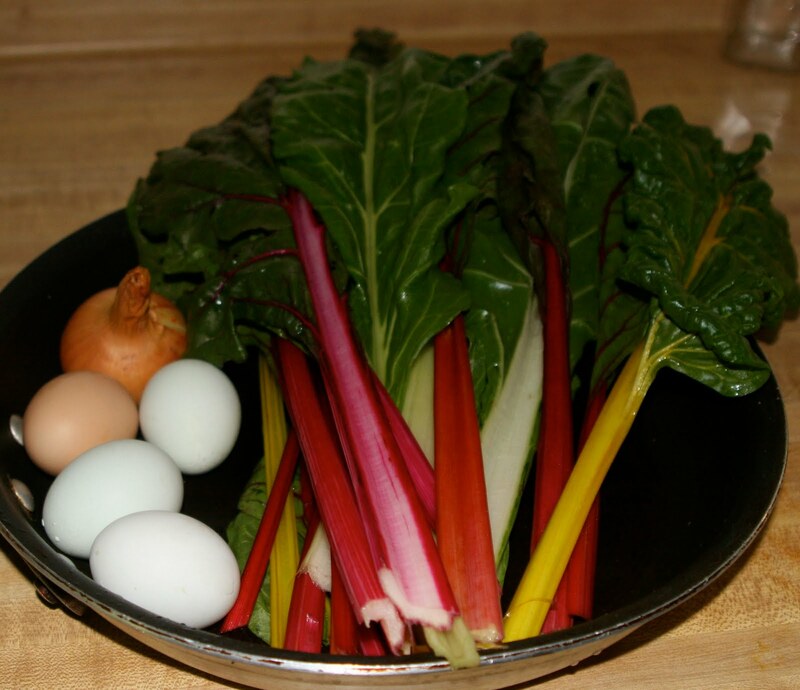 That is why the Rainbow Chard pie picture is much better than the Tomato Pie picture. In the end, photography aside, both pies were quite tasty.